The answers will surprise and delight you as Alexandra Horowitz, a cognitive scientist, explains how dogs perceive their daily worlds, each other, and that other quirky animal, the human. Horowitz introduces the reader to dogs' perceptual and cognitive abilities and then draws a picture of what it might be like to be a dog. What's it like to be able to smell not just every bit of open food in the house but also to smell sadness in humans, or even the passage of time? How does a tiny dog manage to play successfully with a Great Dane? What is it like to hear the bodily vibrations of insects or the hum of a fluorescent light? Why must a person on a bicycle be chased? What's it like to use your mouth as a hand? In short, what is it like for a dog to experience life from two feet off the ground, amidst the smells of the sidewalk, gazing at our ankles or knees? Inside of a Dog explains these things and much more. The answers can be surprising--once we set aside our natural inclination to anthropomorphize dogs. Inside of a Dog also contains up-to-the-minute research--on dogs' detection of disease, the secrets of their tails, and their skill at reading our attention--that Horowitz puts into useful context. Psychology professor and dog person Horowitz was studying the ethology (the science of animal behavior) of white rhinos and bonobos at the San Diego Zoo when she realized that her research techniques could just as easily apply to dogs at the local dog park; there, she began to see "snapshots of the minds of the dogs" in their play. Over eight years of study, she's found that, though humans bond with their dogs closely, they're clueless when it comes to understanding what dogs perceive-leading her to the not-inconsequential notion that dogs know us better than we know them. 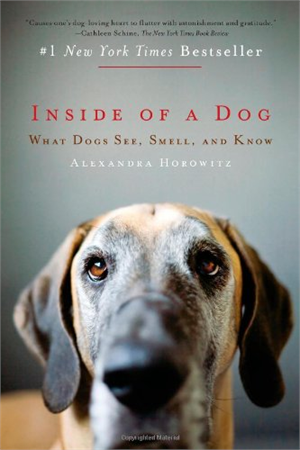 Horowitz begins by inviting readers into a dog's umwelt-his worldview-by imagining themselves living 18 inches or so above the ground, with incredible olfactory senses comparable to the human capacity for detailed sight in three dimensions (though dogs' sight, in combination with their sense of smell, may result in a more complex perception of "color" than humans can imagine). Social and communications skills are also explored, as well as the practicalities of dog owning (Horowitz disagrees with the "pack" approach to dog training). Dog lovers will find this book largely fascinating, despite Horowitz's meandering style and somnolent tone. Copyright ® Reed Business Information, a division of Reed Elsevier Inc. All rights reserved. --This text refers to an out of print or unavailable edition of this title. "Discover why your dog is so sensitive to your emotions, gaze, and body language. Dogs live in a world of ever-changing intricate detail of smell. Read this captivating book and enter the sensory world of your dog." -- Temple Grandin, author of "Animals in Translation" and "Animals Make Us Human"